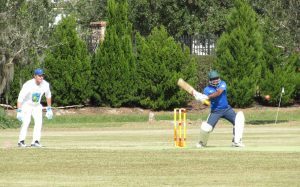 One of our regular annual winter events is the “Six a Side” International Cricket Finals at the Lakewood Ranch Cricket Club. It’s a three-day round robin tournament and we are invited to come on the concluding day (finals), which this year was on November 25. This year’s event featured six squads representing London, the Cayman Islands, a mixed team from down under (Australia and New Zealand), plus entries from Florida, including the local Sarasota club. Twelve cars met at the Outback Steak House on University Blvd and caravanned the short distance to the field. Our LBC’s were on static display throughout the day and at half time slowly paraded around the field to be admired by the fans. The announcer correctly identified our individual cars as we drove past the stands, although those in the mostly British crowd were familiar with the various marques. Based on input from Bruce Skaggs.